In 2018, Hager Group's visitors, partners and employees once again chose Hager Forum for gatherings where exchange, openness and collaboration were the name of the game. The Hager Forum team organised 224 site tours and 91 events, as well as providing quality hospitality to over 70,000 people using the meeting and training rooms. Mission accomplished: the team helped cement the space’s role as a sounding board, catalyst and scout within Hager Group. Let's have a look at the most memorable moments of the year! Hager Forum promotes interaction internally and externally by inviting its users to meet at the heart of Hager Group's largest industrial site. From informal meetings and training sessions to events with participants numbering in the hundreds, formats run the gamut but the objective stays the same: to shape the future of Hager Group together. Over the course of the year, Hager Forum has hosted numerous employee events to celebrate achievements and encourage initiative. However, two events designed with the company's transformation in mind made a particular splash: the launches of the Agile community and Tech Days. When it comes to training sessions, customers are in the limelight: training events are the customers' chance to discover Hager's solutions and services. This is important because the company strives to maintain a close relationship with its partners. 224 in 2018 meant roughly 3,300 customers, partners and employees. Their guides – passionate salaried employees volunteering their time – took them on an immersive journey to explore our history, our values, our solutions and our production tool. In the space of a few days in March 2018, nearly 200 customers from 11 countries turned out for Frankfurt's Light&Building fair! It was a shining moment for the teams, who broke their record again in October with 39 visits or nearly 600 visitors. This is key to the Hager Group community’s continued expansion and consolidation. Hager Forum is a window to the outside world: to learn, explore and never shy away from bold issues – that's the goal we've set out to accomplish with cutting-edge conferences and workshops. Some spotlighted subjects: the big trends of tomorrow with futurist Anne-Lise Kjaer, the circular economy with economics and sustainability expert Leo Johnson; the meaning of impossible, culminating in a Creativity Week conference with Cathy O'Dowd, the first woman to climb Everest. Various aspects of business ethics were explored during Positive Impact Week: conference-debate with Roger Steare, corporate philosopher, educational workshop on conflict metals and improv theatre. Capping 2018 was an event many called "the best conference of the year". Expert Daniel Hulme demystified artificial intelligence and shared his thoughts on its impact in our lives today and moving forward. It was a healthy dose of inspiration for everyone! And a good opportunity to invite partners or customers to enjoy a nice time on site, remotely on hagerforum.com live or offline. The list of external collaborations and synergies goes on, notably the Peter-und-Luise Hager Foundation-backed Obernai Music Festival concert or Industrie Magnifique, the occasion for Mann auf Stier, the statue normally perched at the Hager Forum entrance, to get out and see the world, starting with the people of Strasbourg. 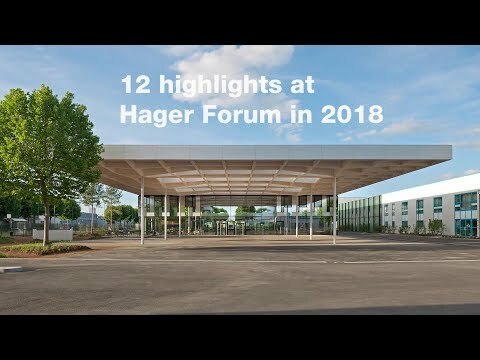 But we prefer you learn about our most shining accomplishments in the video: Hager Forum Flashback I 12 highlights in 2018. Keep your eyes peeled, the 2019 programme will be inspiring! 22.05.18 Creativity Week 2018 – You can achieve the impossible! Creativity Week 2018 – You can achieve the impossible!